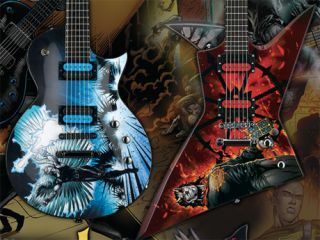 Comic book-loving metal guitarists: you new favourite guitars might just be heading for Frankfurt Musikmesse 2011. The latest move in the Japanese guitar giant's collaboration with Eternal Descent creator Llexi Leon sees three strictly-limited axes set for launch at the show on 9-10 April. "On 9-10 April, ESP Guitars Japan will simultaneously unveil a range of three Eternal Descent guitars at two high-profile events - Musikmesse in Germany and Kapow! Comic Con in London. "The three guitar models are strictly limited to 50 of each design and are inspired by three major characters in the Eternal Descent comic book series: Lyra - a volatile succubus; Loki - a twisted demon; and Sirian - a fallen angel. Photos and specifications for the Eternal Descent range are available here. "Eternal Descent is a comic book and music series unlike any other, a cross-genre story that blends elements of fantasy, action, music, superhero, gothic, science fiction, supernatural and other elements into an ongoing saga. "Llexi Leon is the creator of multimedia concept Eternal Descent - which began making noise in London, England in 2005. His highly intricate guitar style exhibits the many influences corralled to create his intense sound - from classical, flamenco, electronic, and ambient genres to the more prominent genres of rock and metal. "Fusing these genres into one, Leon created a cinematic fantasia to accompany the ongoing Eternal Descent comic series, which launched March 2010 from IDW Publishing. "Leon's love of music is only matched by his passion for comic books and animation - bringing stories to life through escapism, utilizing everyday events and a vivid imagination to create ongoing sagas of art, narrative and sound. "Working closely with major names in the music and comic industries, Eternal Descent continues to expand globally in both areas. A slate of 2011 releases include comics, interactive media, novels, music, and signature musical instruments. "Headline recording artists Atreyu, Firewind, Shadows Fall, Static X and more, have appeared in the Eternal Descent comic series so far, with many set to collaborate on the new album." MusicRadar will be packing its suitcase and decamping to Frankfurt next week to bring you all of the latest product news, videos and interviews live from the show floor. Meanwhile, our one-stop guide to everything Musikmesse can be found here.